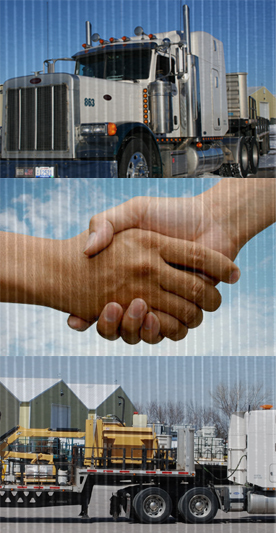 Colman Transportation Inc. is one of North America’s most experienced flatbed trucking companies. Our focus continues to be safety, competitive pricing and a personal commitment to quality and service. Colman Transportation can handle all of your flatbed truckload needs from all classes of building materials, steel products to machinery and everything in between. Colman Transportation Inc. is ideally headquartered in Colman, South Dakota. We provide expert flatbed service solutions throughout the 48 continuous states. With the high volume of loads that we are currently handling, it allows us to provide unbeatable rates and exceptional service. Colman Transportation Inc. can provide solutions for your challenging shipping needs. Our specialized equipment includes a complete line of new model trucks with 48’ step-deck trailers, 48’ flats and 48’ double-drops with double or triple axles. These trailer types enable us to accommodate various types of machinery and other commodities that have additional loading and off-loading requirements. Simply put, Colman Transportation Inc. can easily handle all of your special transportation needs. Colman Transportation Inc. is proud to be a leader in safety. Our team of professionals is committed to ensuring safety and that is the number one consideration in every aspect of delivering your freight. We believe it is our responsibility to hire only the safest drivers to put behind the wheel. Our drivers average 20 to 30 years of experience and the quality of service they provide is exceptional. At Colman Transportation Inc. our drivers understand customer expectations. No one commands more professionalism than Colman Transportation, and if we put a trailer under your load, we take full responsibility. for a freight quote today!